This post was written by Emily Springer. Emily is a health marketer and design strategist supporting Action Design event coverage in Washington, DC. 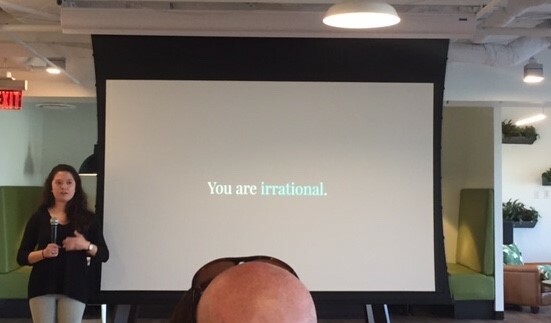 Recently Action Design DC had the pleasure of hosting Alicia Salvino of Brave UX to talk about cognitive bias (read: arguably the whole reason why design thinking, UX and the study of behavioral psychology at large exists!). But how do we build for irrationality? 1) Cognitive bias - Similar to Daniel Kahneman’s System 1, Alicia describes cognitive bias as how our brains unconsciously process our complex environment by categorizing all of the inputs -- accurately or not -- to make sense of them. Cognitive bias is universal and unavoidable, but creation of these associations are necessary for us to take in our surroundings. 2) Individual bias - Individual bias is based on a person’s experiences. It is deeply personal, and involves a strong emotional connection. For example, when someone has a bad experience at a restaurant (e.g., a long wait to be seated, horrible service, average food), they might have a strong aversion to that restaurant based on that one experience. So how do we design for irrationality? While every user context is different, there are three things Alicia urges us to keep in mind. 1) Ability - When testing users, note that people are notoriously bad at assessing their own ability to do something. Research shows that if you are good at something, you likely don’t think you are as good at it as you are relative to other people. This is because you understand the skill or field in-depth, and feel you have a lot more to learn. Alternatively, if you are bad at something, you don’t know how bad you are at it. This is because you know less about it. When considering a consumer’s ability, it’s also critical to remember that people are always multitasking. We might be able to see that a web page was clicked and kept open, but we have no way of knowing whether the user got interrupted, the UberEats delivery guy arrived, his or her boss called or the baby started crying. Account for this by conducting testing in a natural context where distractions happen, if possible. 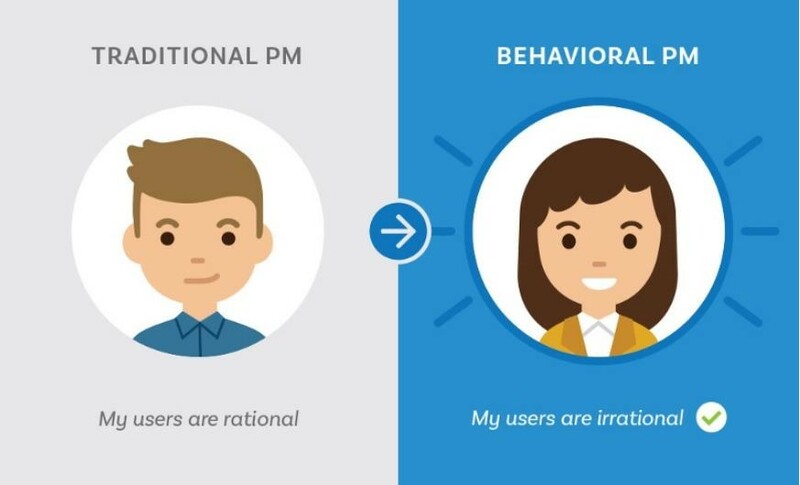 2) Ownership - The second factor to consider when being mindful of a user’s irrationality is ownership. Ask yourself, how can we design so that users can make their mark on a product? One way to create ownership through experience is to apply friction in an intentional way. For example, think about the IKEA model. IKEA allows customers to a) purchase parts, and b) build their own furniture -- creating more value among customers as they took the time and effort to build it. The investment matters to them. This concept is consistent with the i+1 learning principal and endowment effect, which says acting effort is needed for effective learning. 3) Identity - The third way to think about irrationality, Alicia suggests, is considering the user’s identity. Ask yourself: How will the user see themselves reflected in this product or service? What is the user being remembered as? Think in terms of BuzzFeed quizzes. Yes, these are ridiculous. But, people love them! And that’s because whether it’s a type of cat or a Disney princess, people take the click bait because they like inputting their information and seeing if they identify with something. Giving users a way to relate can help enhance their experience with a product or service. While there are no easy “hacks” to cognitive bias and designing for the irrational humans that we are (remember, we are ALL guilty! ), taking the time to honestly reflect on the above can help guide us. What are principles of psychology you’ve applied to combat cognitive bias? Comment below. In this week’s episode, our hosts sit down with Linnea Gandhi, managing partner of the boutique consulting firm BehavioralSight and Adjunct Assistant Professor at the University of Chicago Booth School of Business. Linnea, Erik, and Zarak discuss the importance of following the scientific method. This process applies to all settings, including the corporate world where the demand is always for results – and getting them today (or yesterday, if possible). Avoiding gut reactions, intuition, and emotional responses – and instead replacing them with statistics, data, and algorithms – will lead to more optimal decision-making. But how do we apply this process, especially in situations where important decisions are at stake? Linnea’s focus is on getting executives across industries to realize that we are all more capable of creating algorithms than we may think – even when it comes to decisions such as whether to merger with or acquire another company, or whether to lay off a significant amount of their workforce. Linnea argues that research and psychological literature are not useful to most people unless you can apply it somewhere practical. So she urges us to make our brains work more like an algorithm by removing intuition from the equation as much as possible. Reduce the “noise” as much as you can and isolate the data. Then, translate your behavioral science improvements to the language of the stakeholders. That is what will truly grab attention. And never forget to be painfully aware of your own confirmation bias. Take this experiment. At work, people presented with savings as a default option, by automatic investments of part of their salaries into a retirement account, nearly quadrupled their savings relative to people requiring to opt into a savings plan. Default options are sticky. We are prone to status quo bias; we favor the existing reality rather than exerting the mental effort to change. Simply, our brains seek to minimize effort and maximize pleasure. However, saving doesn’t have to be zero-sum game. Designing environments conducive to automatic action can help us have it both ways. Default options are critical not only to work with the grain of our ubiquitous status-quo bias, but also to help reduce loss aversion. Loss aversion is our tendency to perceive losses as greater than gains. Try asking friends whether they prefer earning £100 or avoid losing £100. They’ll generally prefer not losing £100. We like holding on to what we have. While saving generally translates into future wealth, we may also perceive it as loss: less money to spend today. But, if we design strategies to earmark our earnings by deducting a portion for savings with automatic investments we can help bypass loss aversion. Choice architecture: Better decisions, less effort. The experiment above shows the power behind “choice architecture” or the blueprint that determines how options appear in our environment. Popular examples include restaurant menus or even something as silly as target marks in a urinal. Aside from the order, layout and framing of information, choice architecture also involves the way an environment is designed to interact with the people who come in contact with it, through incentives and feedback. Note that I’ve made no mention of who the “architect” is. How often do you ask yourself this question? Businesses and policy makers have long used choice architecture to influence social and consumer decisions. At the individual level, however, there is more ground to build on how to become our own “choice architects” to behave in the ways we intend to. At least there is growing appetite to design personal environments that help us make better decisions without the unwanted efforts and luckily today products allow for more personalization to help us do just that. Attitude: do you perceive savings as losing money you can use now? Recalibrate your thinking to reframe savings as a gain and temper loss aversion. Intrinsic motivation: what are your existing preferences? Are you visual? Choose a mobile banking app that can keep track where your income and expenses go every month. Extrinsic motivation: do you have trouble keeping yourself accountable? Surround yourself with people that can pinch you when you’re steering away from good habits or use tools with social sharing features for a dose of healthy social pressure. Reinforcement: do you find it easy to start something new, but hard to keep at it? Design regular reminders to meet small, clearly listed milestones. While these questions seem arbitrary, they’re based on the main tenets behind behavior change. By applying choice architecture, you’re more capable of achieving your goals without the additional effort that makes it all seem less appealing. Whether it’s better health -- or greater financial well-being -- your odds are better when you’re the architect of your own future. So go ahead. Start designing. Video: Ted Talk on techniques to help us manage and practice choosing by choice expert Sheena Iyengar (fast forward to minute 10.25 for ideas on how to become your own choice architect to improve savings). On Tuesday, November 7, Action Design Chicago hosted a panel discussion with four Chicago-based expert behavioral science practitioners. The title of the discussion was: “How to Become a Behavioral Science Professional. Topics included the various ways our expert panelists currently utilize behavioral science in their companies and how to run experiments; advice for how aspiring professionals can break into the field; and what they think the future of this field has in store for us all. Stephen Wendel is a behavioral social scientist who studies financial behavior, and how digital products can help individuals manage their money more effectively. Steve serves as Head of Behavioral Science at Morningstar, a leading provider of independent investment research, where he leads a team of behavioral scientists and practitioners to conduct original research on savings and spending behavior. Steve is the author of Designing for Behavior Change (November 2013) and Improving Employee Benefits (September 2014). Sam Evans is Director of Strategy and Innovation at Egg Strategy, where he specializes in helping Egg clients focus brand strategy and innovation to design products and services that change behavior and drive growth. Sam has more than 14 years of brand-building experience from multiple perspectives, including several years at PepsiCo and extensive agency-side experience across major consumer brands like Merck, Kimberly-Clark and Kraft. Erik Johnson is the Marketing Optimization Manager on Morningstar’s Behavioral Insights Team, where he applies behavioral science principles to marketing processes and communications. The Behavioral Insights Team is a group of researchers and practitioners who use behavioral science to help Morningstar better serve investors and be more effective as an organization. Erik previously held roles at ideas42, IBM, and co-created ProductPsychology.com. What are some of the challenges you face in your careers? EJ: I want to build on what Steve said about organizational and structural change. This stuff seems really easy on paper, like ‘Let’s just implement a nudge!’ Change takes a long time and you have to look at this work as a behavioral problem in and of itself. SW: I think it’s really about staying true to how little we know. There’s great temptation to sell snake oil. To be very frank. And there are a lot of people who do in our field. And the challenge is that much of the research we draw on is not in the context of which you work. So what do we do with that? We have answers that can help you, but at the same time, we’re not sure. It’s a very difficult stance to take. And there’s always temptation to have more confidence than the data says. LG: I’d build on what Steve said. People read about this, they get excited, and they think that behavioral science is a silver bullet. A majority of industries I work with, pharmaceuticals, financials, the publishing business, etc…how do you reeducate people that we don’t know if this is going to work? We don’t want to tell people they’ve been sold something that has limitations. We can’t be sure this is going to replicate, persist over time, persist if everyone puts this stuff in place…And even if we can check the box for all of that, can we even scale this? All of these ideas of generalizability are hard to articulate because there’s uncertainty involved, but they’re also neat. This is our way of giving back to academia. But it’s a challenge. SW: I can add on to that. One of my heroes in the field, Dean Karlan, has a book called ‘More Than Good Intentions’. He took down micro-credit and micro-lending. Because after thousands of people with good intentions went into developing countries and said, ‘What we need is to give small value loans at high interest rates, and people said, YES – This is helping!” then Karlan went in and said, ‘OK, but how is this working? Where is the control? Are we really helping people?’ He went in to study this and ran some of the first randomized control trials to test the impact of these interventions. And what he found was that the effect was nothing to negative. What’s another name for unsecured debt at high interest? Credit cards! So when I think about this, the work we’re doing is relative to people basically going blind. Running into a problem blind and saying, ‘We have our good intentions, we have an answer, we’re going to go and do it!’ But we know that most of people’s efforts are a failure and a waste of time, and ten years later they’re going to realize this. And while it’s really hard to take the stance of a structured humility, it’s a lot better than looking back after ten years and saying, ‘What the hell did I just spend my time doing?’ So it’s a very difficult stance to take. We know we’re helping, but it’s the not the silver bullet. LG: Its’ the difference between insights and methods. Methods is where it’s at. SE: You (to Steve) said something years ago that stuck with me. Rather than keepers of the deep truths, our aspirations need to be ‘Let’s be a little less wrong.’ Let’s take the pressure off and try something. That pressure hinders our ability to try something new. There’s endless complexity because humans are endlessly complex. Let’s think about what is the larger frame. I am a creative problem solver. Once we frame the problem, what is the problem our clients are trying to solve, but can’t do today? Behavioral economics is not the microwave of society. It’s a way in. For people who might not be working in a closely related field, the aspirational behavioral science professional, what’s it like to actually work at your organizations? What are you actually doing? SW: First, we spend time thinking about what type of problem we’re solving for people, come up with an experiment, and seeing where we’re wrong. That means working with software people, running with A/B testing, email, mail. Second, we write. And then we do quite a bit of internal consulting. We’re a small team. We started in marketing, and now we’re working across the company. It’s a lot of coming in and seeing if we can apply the research that’s out there in a thoughtful and limited way. I’m where researchers go to die – management. SE: On my happiest days, I’m workshopping with clients and pushing their thinking. My job is to get clients down to specifics. Asking whose and what behavior needs to change. We do a lot of smart phone and in-person ethnography. I like the crazy projects which afford snapshots of behaviors. And pushing clients on the back-end about how to change the way they’re thinking. A lot of positioning, framing, and implementing. LG: I do a mix of activities. I manage myself. I’d say that projects vary from ethnography. You have to observe what’s going on. Then it’s how to match that up with what we know theoretically. Then we have a big list of hypotheses. Then it’s about what we can control within the company. Then we choose what we can run as rigorously as possible, a test. You have to see how wrong you are. Lately, on my good days, what I love doing, is the science of doing science. I work a lot with people doing market research. This toolkit can be used for making this research better. Behavioral science can help you figure out how to tease out a bit more about their preferences. The thing is about how to get people to work better in the back room. Something I’ve been working on is akin to pre-registration, a version of that is to independently write down what people are predicting to keep people honest. How are we going to know if what we’re doing is working? You’d be surprised to see the disagreement that you wouldn’t think is there. Incorporating really easy exercises from the decision-science literature is a nifty day for me. EJ: That covers a lot, so I’ll mention the grunt stuff. There’s a lot of grunt work too. Actually executing this stuff involves managing people. It’s keeping 15 experiments at once. It’s about navigating the data and analyzing, prepping it, cleaning, etc. Building email and websites. And then, there’s a lot of training, speaking, and writing. And talking to the wider field. What are some skills or attributes that you’d recommend for a person looking to work their way into this field? Could they even be building up a portfolio to someone hiring in this field? LG: I would say people skills! You have to earn the right to do the stuff you want to do. To me that means taking jobs you’re not that jazzed about and sneak behavioral science in. Building relationships. You need to sell yourself to get to do this work. Another thing is basic stats. It’s important for reading the primary literature and for getting creative about measurement. Basic statistical concepts so that you can jimmy something as close to an experiment as possible is really useful. There are a lot of people going into this field, maybe you feel there’s a proliferation, maybe even a bubble. And if the bubble bursts the people who will be left standing are the people who actually understand this stuff, who actually understand science and the methods behind this. And finally, find your sand-box. You have a sand-box right now. What’s under your control right now? You can change around the way you do emails, even the way you set up your kitchen counter. There’s a lot you can be doing, sort of an entrepreneurial spirit about what you can be doing. If you’re trying to build a portfolio – where do you not have to earn the right to play? Go and do work in that space. EJ: One maybe non-obvious one, have a blog and write about it. That’s the first thing I did. I have no formal qualifications to do things in behavioral science. I started reading a lot and writing about it. It demonstrates you know what you’re talking about and you have enough passion to take the time to write about it. It was very helpful getting started. If you’re in a company, find a way to run experiments. Take the time to learn basic statistics. The book Naked Statistics is good to get the basics. I would also pick up a technical skill, like coding. The specifics will vary on what field you’re in, if you’re doing email marketing, UX, etc. There’s tons of free resources (e.g., Coursera, boot camps, etc.). The last thing I’d say is, build up as much credibility as you can. I helped out with Action Design. I helped a researcher build a website. I started at Ideas42 as a project manager. Think about ways to build your ways into organizations and establish credibility. It’s a very approachable field. SW: I usually look for demonstrated interest in one or two areas. I meet a lot of people who say they want to be behavioralists. One of the first questions I ask them is what they have read. I want people who have shown an interest, not by reading half of a job description, but by showing they have an interest in the psychology. We have people from a practical background, a sociologist, an economist, and a political scientist. There’s no title I look for. I look for people who like understanding how people behave. The level at which they come in have different requirements. If people are coming in at entry level, I want to know that they’ve read books in the field that they can talk about. For someone who is more senior level, I want to see that they’ve had some formal training. The second is, are they consciously thinking of interventions and how to measure them? We focus on helping people, on doing something. It’s a different mindset. We have a toolkit – so ask ‘What can we do?’ That means that at the junior level, it’s the ideas. The more senior level, do they know experimental design and how to run experiments? And throughout all of that, I look for a healthy skepticism. If people can’t tell me what they did wrong, they’re out. We have to have that internal sense of skepticism; where are we wrong, and where can we learn more? SE: I look for people who are interested and are interesting. You can’t teach passion. I want to look for people who are scrappy about solving problems and are curious, always questioning the answers. You should be reading the literature, volunteering, getting involved. I’d also mention storytelling. The best ways to really create momentum is by telling really compelling stories. One of my brands is producing really great stories. They’re not innovation strategy decks – it’s imperative to tell the story – understanding your audience and facilitating that call to action. I look for people who are masterful storytellers – and that starts with telling your story to me. What’s your story, and how are you positioning your story to me? It’s really about communications skills tied to interpersonal skills. SW: If you haven’t seen Eric’s post about job possibilities in behavioral science: Go read it. What are your thoughts on where the field of behavioral science is going in the near future? I don’t think a decade ago that many people would have thought that governments would have Behavioral Insight Teams. As a subset of that, what role do you think ethics will play? LG: I kind of think there’s a bubble, because it’s not very defined right now. It’s kind of a buzzword, and I think it will pop in the near term, but I don’t think it will go away. I hope people will understand it’s just another toolkit. I think it will start specializing more, the way data science has, and be incorporated as just another tool. It’s not a magic secret sauce, it’s just another thing we do. Separate from that, I don’t think this is a bubble, is experimentation pure and simple. That is something I think is starting to pick up steam. From an ethics point of view, Thaler will always say that you have to make some choice, you have to use something, why should we just keep doing something we have always done? That’s the Choice Architecture argument. I think there’s some ethics in experimentation. There was that backlash when Facebook did that experiment on their newsfeed. I don’t have a good answer about that. I say do no harm, don’t take advantage of people’s limited resources, don’t convince yourself that what you’re doing is great, follow the Golden Rule, and be humble. We know we’re going to fail. Do pre-mortems (e.g., write the narrative of how projects will fail before starting them). EJ: I think this field is still so new in actual application. How people do this in the real world is all over the place and very ill-defined. I think design is a good example. It’s not what companies used to think of. Same thing with data science. So people have to figure out the same with behavioral science. There are a lot of models to test outside of labs. There’s a long way to go. SW: I think of behavioral science like Math and English. It’s not very common to find a job listing for a behavioral scientist in the same way it’s not common to find a job listing asking for a Math or English major. More often it’s in the skills you need. An understanding of psychology, an understanding of testing, and of how to help people. I see an institutionalization in companies in this way. This is happening in product, design, marketing, and HR. In terms of ethics, most importantly, I say serve your users. Are you helping them? There’s nothing wrong with helping your company, but that should be second. Consider everything you do to be public. If it was made public, would it hurt you? SE: I worry about putting this on a pedestal. Making the focus of this field the thing itself. If we focus too much on the tool, then we forget about the point of solving problems. We’re going to be wrong a lot. So if you view all of these things as lenses we can test, I think that’s the question. Let’s have humility. I think we need to stand at the intersection of humility and credibility. EJ: I think we need to shift the perception from the fun examples of heuristics to a process. The reason a lot of people are interested in this, but they don’t know what do with it, is that they have no idea of the process behind it. So we have to change the thinking. This is actually a process. The mind is so fickle that we’re never going to have universal laws. Maybe things work, and maybe they won’t. But we have to sell the process of solving problems. SE: People have read the books, and we now have to help them solve the how, not the why. Today, we launch our third Action Design Radio Podcast! This week’s episode, "The Social and Personal Impact of Nudging," Erik and Zarak chat with Dr. Rory Gallagher about his journey from academia to government. This episode focuses on the application of behavioral concepts to government to create better public policies and services that benefit citizens in myriad ways. We also discuss his new book co-authored with Owain Service, “Think Small: The Surprisingly Simple Ways to Reach Big Goals,” details how behavioral science can help people achieve their goals. Listen to the podcast and let us know what you think! If you like it, sign up to hear new announcements and help us spread the word by telling your friends! Introducing the Action Design Podcast! This coming Tuesday, October 10th is our Action Design Radio official launch! Action Design Radio is our podcast that explores a variety of topics through a behavioral science and psychology lens. It is hosted by Erik Johnson and Zarak Khan who are a part of our national Action Design Network leadership team. In our launch episode, "Are Chief Behavioral Officers in our future?," Erik and Zarak chat with Behavioral Scientist Matt Wallaert to discuss how and why organizations should create a Chief Behavioral Officer position. Matt shares insights and examples from his 15+ years of behavioral science experience to explore how academic concepts can be practically and efficiently applied to businesses. Ethical considerations are discussed, always keeping the public good in mind. Low operational costs and high efficacy make the creation of a CBO position a savvy idea for businesses. Listen to the podcast and let us know what you think! And if you like it, sign up to hear new announcements and help us spread the word by telling your friends! Zarak: Thanks again, Nick, for an excellent talk the other day. Nick: Thank you for having me for the third time in about 18 months at Action Design DC. As usual it was a pleasure. Zarak: Could you give us the gist of your presentation for our members who couldn’t attend your talk? Nick: The talk was a preview of my latest workshop. The focus of the talk was on how learnings from behavioral science can be applied in the area of designing incentives and rewards (feedback) systems. There are two major learnings on how understanding human nature can lead to better incentives and rewards systems. First, when we deal with a one-time-off behavior, such as signing up for a service, monetary incentives work rather well. Behavioral science gives some tips on how the perception of these incentives can be magnified. For example, instead of giving a relatively small amount of money (e.g. $20) to every new user, a company can organize a lottery with a grand prize of $100,000 and with a probability of winning of 1 in 5,000. The objective expected-value of entering (playing) this lottery is $20, but because people overestimate small probabilities, the perceived value of entering this lottery is approx. $5,000 (according to calculations based on Prospect Theory). Another way in which the perception of monetary incentives can be “supersized” is to give objects instead of cash. Recently I won a prize in the form of a Visa gift-card with some cash on it and I ended up spending the money on groceries. I can’t say that I mind cash or that I’m not aware that I got some “free” groceries out of it, but I would have definitely appreciated more an object that is meaningful to me such as a good book or a new Fitbit. (Not advertising, just a big fan). Zarak: Nick, these are great insights. What is the second major learning? Nick: The second learning concerns repetitive behaviors. Most often, companies want people to perform recurring behaviors. This goes from treatment adherence to compulsively using your social media apps. In the end, it is about performing a behavior repeatedly. In the case of recurring behaviors, quite often behavior and natural feedback are decoupled. During the talk, I gave the example of trying to lose weight by sticking to a diet. Going on a diet and, most importantly, sticking to it is unpleasant and requires a lot of willpower. Unfortunately, results of dieting don’t come very soon. It can be weeks before one notices some weight loss by going on a scale and even months before receiving the natural feedback of feeling and looking better. One of the reasons people give up dieting is that they keep on denying themselves treats without any noticeable positive feedback. I call this time span between starting the desired behavior (e.g. going on a diet) and the moment when natural feedback occurs (e.g. less knee pain) “the dark, silent period”. During this time, there is no feedback, no reward there’s just an agonizing exercise of willpower. Good rewards/ feedback systems fill-in this gap between the desired behavior and the natural feedback. Zarak: That is absolutely great insight, Nick! Zarak: I noticed that during your talk, you were critical about “Framing of Outcomes” and “The Fun Theory”. Could you give us more details on this? Nick: Ha, ha! Zarak, my middle name should be “Critic” [laughs]. I guess, the main takeaway is that, when you see examples that seem very easy and appealing, they aren’t all that easy to apply in real-life settings. Among behavioral science enthusiasts, there’s this belief that reframing a situation as avoiding a loss rather than achieving a gain (reframing outcomes) is a panacea for behavioral change. I don’t challenge the power of reframing outcomes. It is, indeed, very powerful. But, it also is rather difficult to apply in practice. Zarak: And about The Fun Theory? Nick: Regarding “The Fun Theory”, I guess we have a clear case of mistaking “appealing” for “effective”. The main idea behind “The Fun Theory” is that once you make a certain behavior fun, people will keep on doing it. There’s some truth there, in the sense that we, humans, like to do fun things. However, there’s a big flaw as well: something that is fun now will not be fun the tenth time we do it. After all, you won’t lough at the same joke more than twice. In short, making things fun is good for one-time-off or infrequent behaviors. For supporting repetitive behaviors, you need variable feedback. Zarak: Thank you, Nick! We look forwards to hosting you again! Discover Nick Naumof’s workshop on Behavioral Science for Designing Incentives and Rewards. As marketers and designers in the digital space, we often get caught up in driving consumers to take specific actions and lose sight of why these decisions are being made. We understand how specific tactics work through testing and best practices, but rarely understand the psychology behind why. Brian Cugelman has been studying the psychology behind digital decision making for almost twenty years. While in town for his recent workshop Brian took the stage at the Morningstar auditorium to address Chicago’s Action Design Network on Digital Behavior Change. The workshop and presentation gave users an in-depth perspective into the psychological principles used to drive behavior in the digital space, as well as their practical application. This material revolved around his interactive influence model. The model breaks down nine domains of interactive influence; from initial exposure through desired outcome and finally, feedback. Each one of the following stages is thoroughly explored and broken down throughout the workshop. Source: This can be a company, brand, or otherwise that is creating content for users to interact with that can be trusted and earn a reputation. Source message and functionality: The actual message or functionality that the source provides to the audience. Source message expression & audience interpretation: The way a message or functionality is expressed by the source and then interpreted by the audience. Audience: The person, group, or organization you are trying to engage and influence. Audience feedback and behavior: The actual feedback or behavior expressed by the audience that is recorded in the media. Audience feedback expression & source interpretation: How the audience expresses and transmits their feedback to the source, who interprets it. Source feedback adaptation: The persuasive and behavior change techniques that depend on user feedback. If the source has not previously captured feedback from the audience in domains 5 & 6, then none of the persuasion techniques can be used. Social and physical context: The social, physical, or virtual environment in which relationship occurs. Behind each of the domains we took a deep dive into the psychology of digital users and their decisions online. Both the workshop and presentation gave us a fascinating look into loss aversion and incentives with a re-work of Maslow’s hierarchy of needs by Douglas Kendrick. This segued into the different types of neurochemicals, how they are released in the brain, and understanding impact emotion cognition and behavior. Applying the above, we are able to create experiences that cause the brain to release cortisol and dopamine to drive action. Cortisol is triggered by creating a threat to the audience. For example, anti-spyware companies letting me know that my computer is at risk of infection. This grabs the user’s attention, and drives them to remove the threat by taking action. On the other hand, Dopamine is triggered during any experience that promotes survival by creating anticipation of reward. This drives users to pursue this reward. For example, companies offering a free gift for signing up for a service. Overall, Brian Cugelman gave us great insight into the nine domains of his interactive influence model, an in-depth dive into the neuroscience behind each, and how to practically apply these concepts to digital design. He presented to the action design group on motivators and detractors within the digital space. His workshop and talk gave designers an understanding of why consumers make the decisions they do online. If you would like to learn more about Brian and his work, visit https://www.alterspark.com/ for more information. Welcome to the Action Design Blog! Hello there! We’re Action Design, a group of people around the world who are working to promote the use of behavioral economics and psychology in policy and product design, in an effort to better the world we live in. Our group has over 10,000 members who meet at Action Design monthly events in cities across the world to share research and practical lessons on how to help people voluntarily change daily routines and behavior to improve their lives. You can find more about us, here. We’re excited to launch our Action Design blog to further connect with the world by sharing research and practical lessons using behavioral economics and psychology. We'll also soon be posting video snippets promoting our behavioral economics content. We encourage you to interact with our blog posts and provide your feedback. If you’d like to get involved with Action Design or guest blog writing, please reach out in the comments.